An Urban Dance styles program for beginners by Rewind Dance Crew. 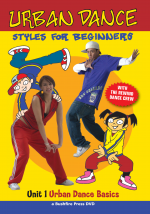 Written for primary school students who are urban dance beginners. Would you like to incorporate urban dance (hip-hop etc) into your program but don’t know where to start? Try our simple DVD-based Urban Dance program – and let young experts teach your students how to bust some sweet moves. Leading Australian dance crew, Rewind, have been winning national dance competitions since the early 2000s and have represented Australia internationally at the World Hip Hop Championships in Los Angeles. They encourage an active lifestyle emphasising the importance of hard work and commitment and are active in promoting hip hop dancing through community classes and events, as well as pursuing their own competition goals. In this first instructional DVD, the basics of urban dance choreography and Hip Hop influenced movements are taught in a clear and easy-to-follow way through 10 lessons – from warm-ups to basic moves, sequencing and cool downs. Learn how to put moves together to create your own dance or create team moves for your dance crew … the 8 count, the “and” count, waves and flows, footwork, turns etc. Play the audio CD and they can practice solo or in groups. Here is a detailed explanation of the content provided in each lesson. All lessons are included on both the DVD and CD.